The day her life changed forever began simply enough. Rhiannon begged a handful of breakfast rolls from the cook, who was yawning as she put together breakfast for the household. Rhiannon kissed Maeve on the cheek, threw on her cloak, threaded her bow over her shoulder and picked up the staff she carried with her everywhere. She stole out of the still-slumbering house, across the courtyard and out through the gates. Emrys and Cai had gone ahead and thoughtfully left one side of the gate open for her. They were heavy to move by herself. She let the gate swing shut behind her. It would no longer be barred, but Emrys and Cai wouldn’t have left it open if they thought there was any danger of marauders stealing through it. They both had exceptional instincts for trouble. Their wariness came from years of stealing away from the house to have adventures of their own in the forest. It had been one such adventure, when they were all barely five years old, when they had met Myrddin, who had become a firm fixture in their lives. It was likely Emrys and Cai were heading for Myrddin’s little house in the forest, next to the holy shrine he took care of. Rhiannon bent to check their tracks. Yes, they were heading in that direction. They hadn’t bothered to disguise their steps this morning, although they sometimes did just to see if she could find them once more. She always did. The rolls she had begged from Maeve would be cold by the time she reached the little cottage but it didn’t matter. Myrddin made the best oatcakes in the world and they were just as good for breakfast as the highly spiced rolls Maeve made. The rolls could be warmed, later, as a mid-morning meal which would tide them over until the noon break, when it would be safe to return to the house once more. The old Roman villa had once been a general’s country abode. The last vestiges of elegance and indolence in the house had been nearly obliterated by a century of harsh farm life. Stables and lean-tos were attached to the outer walls. The shady verandahs protected and stored hay and bags of grain for planting next season. Meat hung, drying, in the high ceilings of nearly every room—especially if the room had a fire pit in the middle. The old frescoes on the walls were faded and the mosaic patterns of the tiles ruined by broken tiles and missing pieces, whose spaces were filled by hardened mud. Count Ector considered himself Roman to the core, while Druscilla, his wife, could count her Roman ancestors on both hands and recite their lineage when asked. The vestiges of a Roman way of life were a result of her influence, not Ector’s. The house had belonged to her ancestors and had been part of her dowry. Ector had turned the run-down building into a working farm which kept all of them fed and sheltered when many in Britain could count on neither food nor warmth. Rhiannon had learned all this over the years between observation, discussion with Emrys and Cai, and in formal debate with Myrddin, whose classical teaching was far harsher and disciplined than any lessons Rhiannon’s mother and father dispensed, even though they were the formal teachers in their lives. Not that anyone had time for lessons anymore. While Steffan and Anwen remained in the house with Ector as privileged residents, they had ceased formal lessons more than a year ago. Now, Steffan was employed as Ector’s secretary and advisor, while Anwen provided the scribing and reading, as needed. There was little of that, for Ector was not a great letter writer and the news from elsewhere in the world was grim at best. Which was just as well, for Rhiannon’s mother’s eyes had grown weaker of late. She could only read script that was large and well-formed, or in very good light. More often than not, Rhiannon or Emrys or Cai would provide that service for Ector, while everyone pretended that Anwen could have read the script but had chosen not to. There were other disturbing signs of age in her mother and father that had bothered Rhiannon of late. Her father’s once pitch-black hair, which Rhiannon had inherited—to her mother’s eternal gratitude—was now thick with white and silver, especially at the temples. Her mother’s skin, especially around her soft brown eyes and her chin and throat, was soft and loose. She would sometimes lose track of what she was saying and have to start again, too. She preferred to linger by the fire even on days when the temperature was milder than it was today. She read when she could or would stare into the flames. Steffan often sat by her side and let her read to him. Even Ector’s once rich brown hair was now nearly white. Like her parents, Ector had come to fatherhood late in life and now he was content to live the life of a gentleman farmer. It had been many years since he had answered the High King’s call for men and arms. Not in Rhiannon’s memory, at least. Sometimes, during the winter, when it was safer to travel than high summer, Ector would journey to the south to meet with former army companions. He returned from those long visits looking grumpy and grave and would huddle in his library with her mother and father, and talk long into the night. It seemed to Rhiannon that news from beyond the borders of Galleva had always been grim and had grown darker of late. That was why sneaking off into the forest just after dawn was a foolish thing to do, especially on her own. The open roads were so chancy now she was more likely to meet someone who would kill them for their warm cloaks than not. Mostly, the three of them flitted between the trees and stayed off the roads. They knew every tree and blade of grass for a good five miles beyond Myrddin’s shrine, which gave them an advantage, for people always got lost in the Forest Sauvage. Because she was hungry and wanted to eat, Rhiannon risked using the faster route along the road which ran through the outer corner of the forest where it jutted down from the north, to almost completely encircle Galleva. A mile or so along the road, she could take the woodcutters’ tracks to cut across to the main road north where Myrddin’s shrine lay. Half a mile inside the trees, Rhiannon slowed her steps. The skin on the back of her neck prickled hard. She was being followed. She was certain of it. There had been no sound. They were good hunters, whoever they were, which raised the risk. It was the absence of sound which alerted her. The forest was too quiet. Even at this time of year, before the snow had fully melted and the green appeared, birds and animals called and scurried. None of those creatures made a sound now. They were holding themselves still and silent until the intruders moved on. The only sound was the soft whisper of bare branches overhead. It takes me back to the magic I felt when reading Mary Stewart’s stories of Merlin. Tracy Cooper-Posey has written another winner! He is not the enemy she came to fight. Idris the Slayer is the champion of the northern kings. Undefeated in battle, the dark, lone warrior who rides to war with a black wolf at his side spreads fear before him, even among those counted his allies. When Rhiannon of Galleva rides to her first battle with Emrys and Cai, she expects to fight the Saxon hoards pouring into Britain. She is not braced to defend herself against Idris’ incursion into her heart. He is a dangerous man to be drawn to, for his allegiance lies with king Lot of Orkney, who holds no love for Uther, the aging High King. Rhiannon’s parents, Anwen and Steffan, are loyal to the High King, as is Count Ector, Cai’s father. Rhiannon’s association with a northern man tears open secrets that have brewed for a generation, forcing Uther and his commanders to fight enemies on two fronts. This book is magnificent; the research that had to be done in order to get the details of those times correct and then weaved into a story with just enough truths to make you wonder if it actually occured.. The main characters our wonderful, full of passion and justice and I've always loved the way she brings characters from previous books in a series to her latest ones. The book is filled with details that explain the who, what, where and why of the period the story is written in, which brings richness to the story. I don't do spoilers but know that you will not want to put this book down till you've finished it. 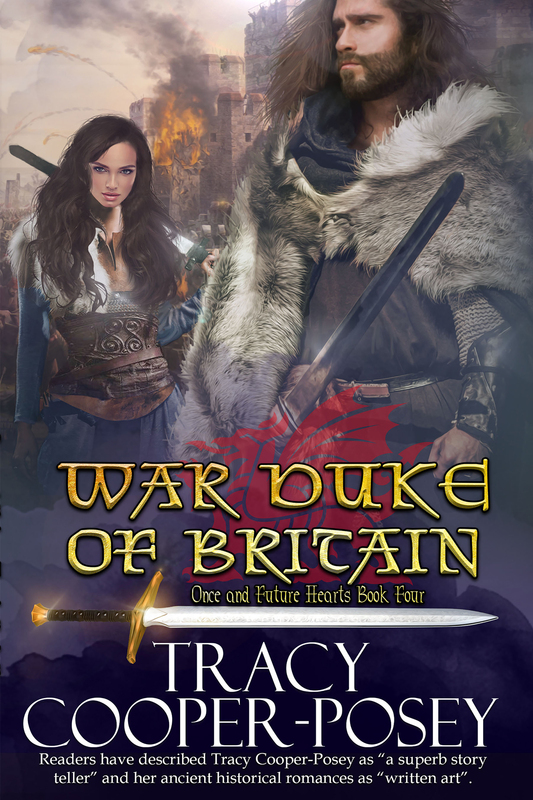 War Duke of Britain is another amazing book by Tracy. I’m impressed with the amount of research she must have done as the attention to details is excellent. This book has everything you could possibly want. It’s full of action, suspense and features a romance between Idris the Slayer and Rhiannon of Galleva. I highly recommend this book. "War Duke of Britain" LOVED IT! This book skillfully weaves a complex tapestry of older familiar characters with a whole new generation of warriors and lovers to set up the primary players in Book 4 of her Arthurian series, Once and Future Hearts. The passage of time and the loss of the older characters resonated with me as I had become invested in their stories. I felt the fatigue and heartbreak of fierce battle and appreciated that the supernatural elements were used sparingly, but effectively. Old souls seeking wisdom, damaged souls seeking solace, pure souls seeking harmony. It is a luxurious cast, set on a tempestuous stage of Britain holding back Saxon invasions. This story is impressive with its breath of detail and history. Tracy Cooper-Posey masterfully leads us in another adventurous forey into a beloved tale. Bring on the next book! Can't put it down and anxious to get my hand on the next one. I love this series. I am so impressed with the research done and how she uses it to tell the story. She brings the whole world alive. I am there when I am reading. Highly recommend this book and the series. Arthur is finally here!! But what a twist!! Imagine how good is the author in her craft that she is capable of surprising us here readers even though the Arthurian cycle is one of the most rewritten one in western literature (in my opinion). Love Rhiannon, the heroine in War duke of Britain, and how she follows her heart instead of the usual conventions. And love the moral of the story about freedom, never forget Rome was built upon slaves. Aaand can't wait to see what happens next with Morgan a favourite of mine and a very interesting character indeed. Don't pass on the opportunity of reading the series, totally worth the time! Yay, we get further into the Arthurian legend, but not how I've heard it told before. For a start, Tracy doesn't focus on the 3 central characters, she's brought the readers from before Uther was High King. And while Arthur and Lancelot are there, these are really their stories. This time it's Rhiannon and Idris, with Cai and Emrys. As always, the strength of Tracy's writing comes from her incredible characters and the fact that even through these are set around 2500 years ago, I can still connect with them and their lives. They make me laugh and cry and I want to read more. What a great storyteller! I never thought that anyone could tell an Arthurian tale as well as Mary Stewart, but Tracy Cooper Posey has succeeded. I am just in awe of her ability to meld historical detail with legends and turn out a mesmerizing story. Tracy takes a story that has been told for centuries and makes it her own while remaining true to the spirit of the legend. The War Duke of Britain is suspenseful and exciting so make time for reading it because you won’t want to put it down. I know that I couldn’t. What an amazing edge of your seat story this turned out to be! The War Duke of Britain was action packed and filled with stalwart soldiers, political intrigue, and humour! The hero’s are unexpected and brilliantly developed! Rhiannon’s character had me crying one minute and cheering the next and as Emrys own truths were revealed I felt the anguish, pain and confusion that accompanied it! There is so much depth to this story ...it’s one you just have to read!